Rottweilers are considered to be one of the oldest breeds of dog with an origin way back to Roman times where they were used as herder or driving dogs. They accompanied the herds following in the wake of the Roman armies through Switzerland and into Southern Germany. In the years 73 or 74 AD the 11th Legion of the Roman Empire shut up camp on the bank of the river Neckar in the Wurtemberg area of Germany. They marched over the Alps with the Roman legions where they protecting the humans and the cattle from wild animals and theft and herded the cattle. Because of this, it was necessary to have a dog that was loyal and faithful, calm yet confident. It needed to lovingly care for and defend the young of the heard and its master, yet still be able to drive thousands of pounds of cattle and protect them from wolves and thieves. A deep ribcage was required for the lung capacity needed for the long miles of running around the herd. Strong bone and muscle were also a must. The large head that the German Rottweiler is now famous for also served a purpose. The large powerful head is what enables the Rottweiler to have the strongest bite force of any domesticated dog, far exceeding even the Pit Bull and German Shepherd Dog. In the years 73 or 74 AD the 11th Legion of the Roman Empire shut up camp on the bank of the river Neckar in the Wurtemberg area of Germany. Many years later, this city became known as Rottweil. Rottweil, a town in the south west of Germany and the oldest town in the federal state of Baden-Württember, was founded by the Romans in 74 AD. It was named “Rot Wil” because of the red tiles used in the roof. (“Rot” is red and “Wil” for “Ville”.) 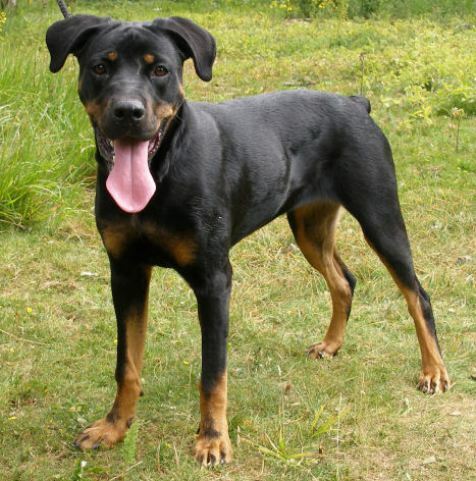 During the Middle Ages, the Rottweiler was used for bear hunting and subsequently as a cattle dog. Because there were other breeds endemic to the regions around Rottweil including the Bernese Mountain Dog, Greater Swiss Mountain Dog, Appenzeller and Entlebucher. These local dogs likely interbred with the dogs brought by the Romans hense the Rottweiler’s similarity to some of these breeds. Because the Rottweiler was formed purely out of a utilitarian need, conformation, or physical beauty, was not as important as the Rottweiler’s core character and temperament. However, as form follows function and function follows form, a strong dog with a heavy frame, stocky build and powerful head piece, that was biddable and high in courage naturally developed. In the 19th century, when the railway became the means of transportation, cattle herding was outlawed and the Rottweiler had to find a new job. This strong, intelligent dog showed himself useful of much more than just herding cattle (although, of course, that too is a job that requires and incredible athlete and limitless intrepidity). He became known as “Rottweiler Metzgerhund” which translates literally to “Rottweil butcher’s dog.” The Butchers recognized the power and courage of the Rottweiler and bred them for these traits. The Rottweilers were used as draft dogs for hauling the butchers meat to market and then, once the meat was sold, the money would be tied around the Rottweiler’s neck for safe transport back home. Unfortunately, at this point in the breeds history, they nearly became extinct. They were no longer required as drover dogs and soon, their usefulness in hauling would also no longer be necessary. In the early 1900’s, the Police Service in Germany began testing different breeds of dogs for use in the police force. 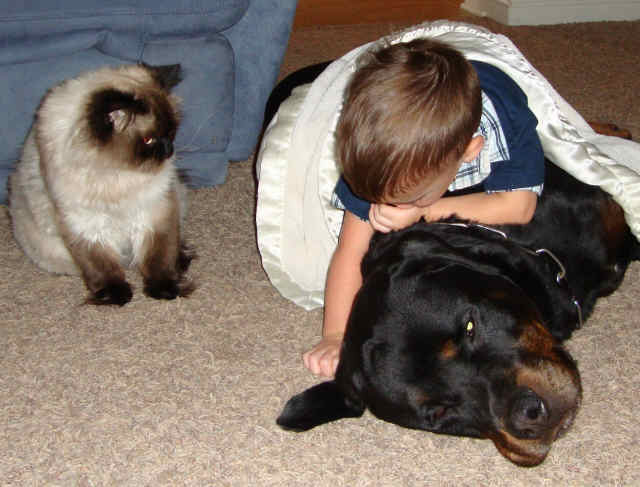 It quickly became evident that the Rottweiler was more than capable and very willing. Having been bred specifically for their courage, intelligence, and workability, the Rottweiler was officially recognized as Police Dogs in 1910. In 1899 the International Club for Leonbergers and Rottweiler Dogs was formed in Germany and the first breed standard for the Rottweiler was produced by this club in 1901. 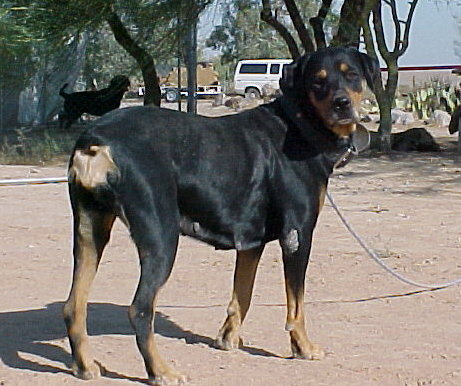 The Allgemeiner Deutscher Rottweiler Klub [ADRK] followed on and was formed in August 1921. 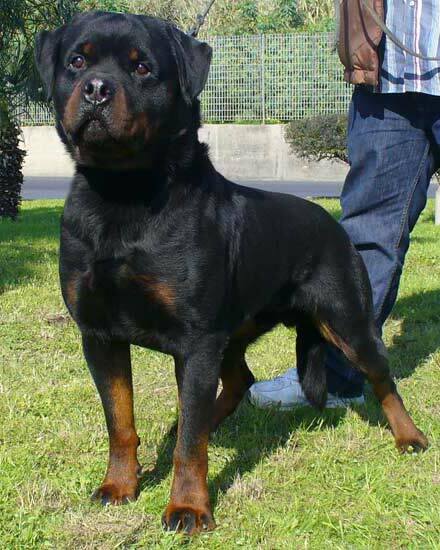 The ADRK is the governing body of Rottweilers in Germany and their motto still remains: “Rottweiler breeding is working dog breeding”. On the left is a reported 120 pound female Rottweiler that is large, but very poorly built. She is lacking in head, bone and muscle substance, and has a very soft topline. Below right, the other extreme, a small, thin Rottweiler also very much lacking in head piece and poorly placed and poorly carried ears, but with a much more solid top line (back is straight) because there is not too much excess weight pulling and stressing the dog’s body. Although significantly lacking in substance, the dog on the right is actually much healthier and sound then the one on the left. She will not have the added stress on large muscles such as the heart or on her bones and joints like the over-sized dogs will.